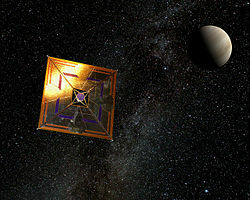 Solar Sails Comprehensive collection of solar sail information and references, maintained by Benjamin Diedrich. Good diagrams showing how light sailors must tack. Suggestion of a solar sail with roller reefing, hybrid propulsion and a central docking and payload station.